SITKA, ALASKA -- The millions of tourists cruising through North America’s last intact temperate rainforest in Southeast Alaska soak up dark green conifers as far as the eye can see. But a troubling side of this chilly landscape also comes into view. Swaths of Alaska yellow cedars have lost their needles and turned a deathly brown. Scientists say the cedar can’t handle the changing climate, placing it at an ever-increasing risk for extinction. On a recent ferry ride through Peril Strait, a narrow 40-mile-long passageway north of Sitka, two Cascadia Times reporters spot a gigantic brown bear foraging near stands of dead cedars, clearly oblivious to another emerging threat. Government bureaucrats want to let the timber industry liquidate its wild Chicagof Island habitat. Someday soon, the view from cruise ships could include clearcuts -- but no bears. During its first two years in office, the Trump administration kept under wraps plans for federal forests -- unlike its very public push to pump up the oil, gas, and coal industries and open disregard for climate change. But in August, the administration unveiled a proposal giving the timber industry access to ancient old-growth trees within the nation’s 50 million acres of wild, intact forests, known as roadless areas. The proposal came to life in January when Alaska Gov. Bill Walker petitioned the US Forest Service to remove protection from Southeast Alaska’s Tongass National Forest. The idea is already controversial in ways reminiscent of the timber wars that roiled the Pacific Northwest 30 years ago. The scheme could extend to Utah, where Gov. Gary Herbert is seeking a similar exemption, and possibly all other national forests. A 1970s era clearcut on Baranof Island near Sitka. Today, clearcutting on the Tongass is still legal, but loggers must not clearcut within a 200-foot buffer zone next to a stream, a rule conservationists say is often violated. Photo by Robert Johnson. Buck Lindelkugel of the Southeast Alaska Conservation Council. “If they can strip roadless protection from the Tongass, no National Forest is safe,” says Buck Lindekugel, grassroots attorney for the Southeast Alaska Conservation Council (SEACC), an environmental advocacy group based in Juneau. Dru Fenster, a Forest Service spokessperson in Juneau, said the 9.2 million roadless acres on the Tongass include about 4.2 million acres of damp muskeg bogs, alpine lakes, steep-walled fjords, majestic mountains and tidewater glaciers. The remaining 5 million acres contain valuable old-growth trees, including Alaska yellow cedar, western red cedar, mountain hemlock and Sitka spruce, some as old as 1,000 years of age. Logging these mature stands could exacerbate climate change as well as cripple Southeast Alaska’s booming recreation and tourism industries, damage a world-class salmon fishing industry and threaten the survival of all kinds of wildlife, not just brown bears. Proponents claim opening roadless areas of the Tongass to logging would help revive Southeast Alaska’s sagging timber industry. Economists say logging here is extremely expensive, given the mountainous topography and isolation from markets. In fact, logging in the Tongass is impossible without massive subsidies. US taxpayers paid billions of dollars over the last 70 years to clear cut its pristine old growth forests, seeing only meager financial returns. Most of the largest and most valuable trees have already been removed, a process known as “high-grading.” The Alaska timber industry wants taxpayers to pay for new roads providing access to remaining commercially valuable trees. “We are talking about multiple billions of taxpayer dollars to clear cut old growth forests and cause major environmental degradation,” says Dr. Evan Hjerpe, a resource economist and author of a report on Tongass economics for The Wilderness Society. The National Forest Roadless Area Conservation Policy banning roadbuilding and logging in designated wild, intact forests is one of the most important conservation measures in US history, alongside the creation of national parks and wilderness. The government held more than 600 public hearings around the nation, and the public provided more than 1.6 million mostly positive comments on the rule—more comments than any other rule in the nation's history. Based on this overwhelming public support, the Forest Service under President Bill Clinton approved protection of these areas in 2001. Gutting the roadless rule falls neatly in line with Trump’s callous disregard for the environment, starting with his decision to roll back Obama-era policies curbing climate change. He also dismantled the US Environmental Protection Agency, scaled back national monuments, dumped fuel mileage standards, and axed regulations curbing carbon and mercury pollution, to name just a few. It’s taken a couple years, but the Trump environmental doomsday machine is finally rolling at full speed. A black bear forages for roots in the Tongass National Forest north of Juneau. Avoiding carbon emissions from forests “is just as urgent” as halting fossil fuel use, according to a group of 40 leading climate scientists from Harvard, Duke, the University of Virginia and other universities in five countries. Cutting down old-growth forests like the Tongass will increase the deadly consequences of climate change. 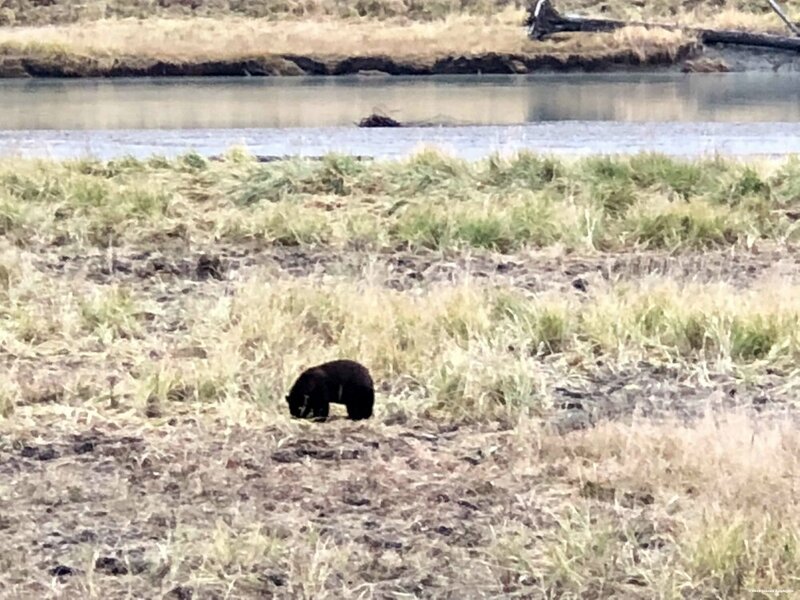 A recent bear sighting near Sitka. “By destroying forests, we not only emit carbon dioxide but also lose the role forests play, through photosynthesis, in taking carbon dioxide out of the atmosphere,” the scientists said in the statement issued by the San Francisco-based Climate and Land Use Alliance. Data show reforestation and improving forest management together provide 18 percent of mitigation needed by 2030 to maintain a liveable climate. Getting rid of the roadless rule, the scientists said, would accelerate global warming by removing large old trees that are capable of trapping far more carbon pollution than younger, second-growth forests. Protecting large old trees that absorb carbon pollution will be critical to any plan rescuing the planet from the onslaught of hurricanes, wildfires and flooding caused by higher temperatures. These forests also provide a refuge for wildlife in a hotter and drier climate, but only if left standing. the planet is going to boil. Few forests anywhere on the planet play a greater role in helping mitigate climate change than the Tongass. The Tongass retains more atmospheric carbon than any forest in the United States, says Dr. Dominick DellaSala, chief scientist with Geos Institute, a scientific think tank based in Ashland, Oregon. “Because it is one of the world’s last relatively intact temperate rainforests, and it has a maritime climate, the Tongass is Alaska’s first line of climate change defense and a climate refuge for its world-class salmon and wildlife populations,” DellaSala wrote in 2016. Alaska is already experiencing a 3-degree F warming since 1949, according to the Alaska Climate Research Center. DellaSala says this temperature increase, the nation’s largest over that period of time, has led to severe long-term consequences including melting glaciers, coastal erosion, and the die-off of the yellow cedar. Alaskan yellow cedar, actually a cypress, features a durable light yellow heartwood often used in boats, bridges and landscaping. In 2014, the Center for Biological Diversity, an advocacy group, petitioned the US Fish and Wildlife Service to protect the Alaska yellow cedar under the Endangered Species Act because of ongoing threats from climate change and logging. The Fish and Wildlife Service has yet to announce a decision. But Paul Hennon, a retired Forest Researcher who linked the yellow cedar die-off to climate change, doubts the troubled tree could go extinct any time soon because its range is “impressively large,” extending as far south as Northern California. Large swaths of dead Alaska yellow cedar line the hillside on Chicagof Island in the Tongass National Forest. Forests like the Tongass are the last refuge for the planet’s at-risk species. The Tongass provides prime habitat for the rare Alexander Archipelago wolf and its prey, the Sitka black-tailed deer. Many scientists say at least half of the planet’s land and seas must be protected in order to avert mass extinctions worldwide, an argument advanced by noted biologist E.O. Wilson in his 2016 book, Half-Earth: Our Planet's Fight for Life. Reversing the roadless rule contradicts critical parts of the 2016 Tongass National Forest plan. The plan allows logging in 73 watersheds identified as critical spawning habitat for five types of salmon: king (Chinook), pink, sockeye, coho and chum, as well as for steelhead and cutthroat trout. Based on a collaborative advisory process, the forest plan classified these watersheds -- 86 percent of which are fully within roadless areas -- as “unsuitable” for logging. Anyone traveling down a logging road to get to a wilderness trailhead sees how public lands are carved up with roads. Today, more than 5,000 miles of logging roads crisscross the Tongass National Forest, fragmenting valuable wildlife habitat, threatening salmon by blocking fish passage, and serving as the primary source of sediment into fish streams. Roads enable poaching of game, trigger landslides, and provide a path for invasion of exotic species and diseases. Roads devastate salmon, says Dr. John Schoen, a retired wildlife ecologist and co-author of a “conservation assessment” of Southeast Alaska ecology published by The Nature Conservancy and Audubon Alaska. Schoen also co-authored Audubon Alaska’s Ecological Atlas of Southeast Alaska (Schoen is board chairman of the organization). But Owen Graham, executive director of the Alaska Forest Association, an industry group, claims that fish populations on the Tongass are about double what they were in 1954. Schoen, however, notes that any jump in salmon numbers in recent decades has been due to a “huge” influx in the number of fish grown in hatcheries. Moreover, salmon scientists do not consider data collected before Alaska joined the Union in 1959 to be reliable. In the November midterm election, Alaska voters rejected “Yes for Salmon,” a ballot measure to give strong legal protection for salmon habitat for the first time in state history. Co-sponsored by SalmonState, an advocacy group based in Juneau, the measure would have made it tougher for industries like timber, mining, and oil and gas to disturb salmon habitat. Campaign Director Ryan Schryver says opponents spent $12.5 million to kill the measure, far more than the $2 million spent by supporters. “The opposition spent a lot of money making people nervous wondering what the unintended consequences might be,” he said. Chester Jackson, left, and Bruce Ulrich, right, discuss fishing in Southeast Alaska. On a recent afternoon at the Pioneer Bar in the heart of Sitka, Cascadia Times reporters met with a group of a half dozen local fishermen to discuss the Roadless Rule. The conversation at one point turned to the shrinking size of fish netted in nearby marine waters. — Sitka fisherman Cheston Clark. Cheston Clark, 50, a commercial fisherman for most of his life, said he wasn’t sure whether to support or oppose the rule change, but expressed contempt for a government that fails to address climate change or protect salmon habitat. “You can’t be a fisherman and not believe in climate change,” he said. Each summer, 1.2 million visitors seek adventure in the Tongass National Forest. And they don’t come for clearcuts. 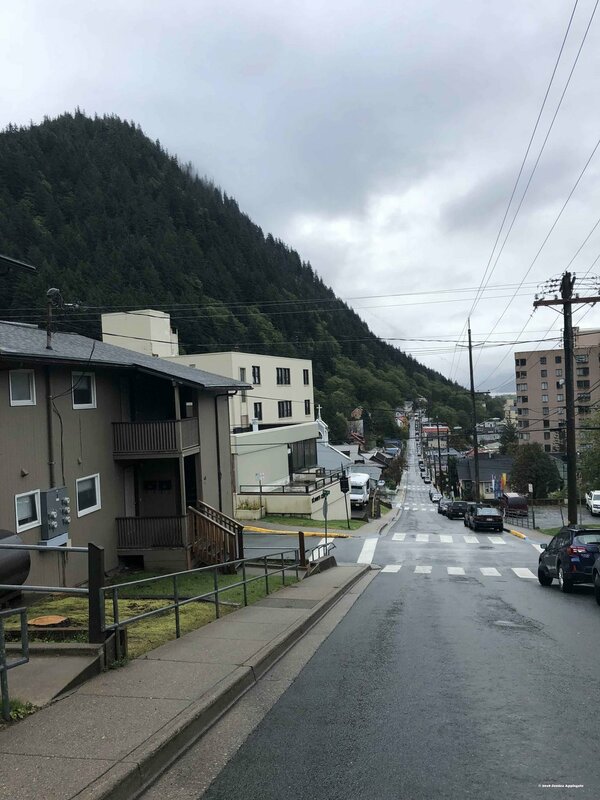 Sitka, a city of 8,000, sits at the western edge of the Tongass. It is the heart of a vibrant $2 billion-a-year tourism, hunting and fishing economy. Here, the immediate concern is that Trump’s plan could stiff-arm the 10,000 people employed by these industries for the sake of a handful of timber jobs. 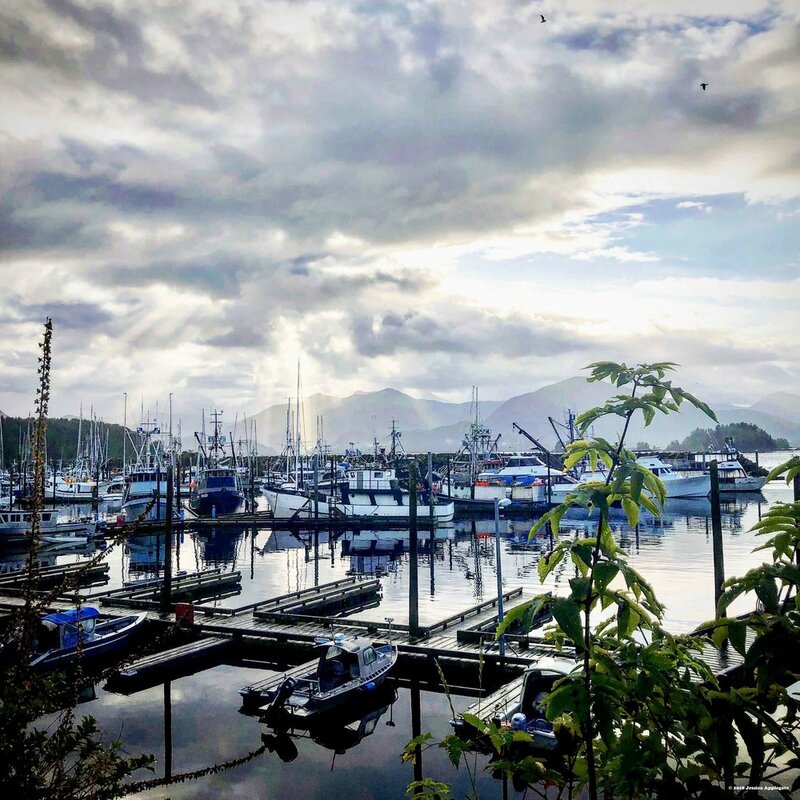 Sitka is located at the heart of Southeast Alaska’s tourism and fishing industries. Trump’s plan is not likely to employ many new timber workers due, in part, to the fact the Forest Service allows companies to export 100 percent of logs cut from the Tongass. Many of the logs go to the only major sawmill still existing in the Tongass -- the Viking Lumber Co. mill on Prince Wales Island, which the company says supports 150 jobs (though independent sources suggest the number is closer to 35). Company officials say the Viking mill is designed to process only large old-growth trees and is not capable of processing the smaller logs cut from younger, or second-growth, forests. Small specialty mills in nearby towns like Hoonah, Tenakee Springs and Wrangell also claim a share. Alcan Forest Products, a log export business based in Vancouver, BC, gobbles up most of the remaining logs and ships them overseas for milling. For many years, the timber industry employed less than 1 percent of the workforce in Southeast Alaska. In 2017, for example, the timber industry employed just 220 people, way down from levels as high as 1,800 in the 1990s, according to Dan Robinson of the state Department of Labor and Workforce Development. At one time timber was a leading employer in the state, “but has been more of a niche industry for quite a while now,” he says. “The economy of Southeast Alaska has moved on,” says Hunter McIntosh, a vocal critic of the plan to rollback the roadless rule. He is president of The Boat Company, a non-profit educational organization that has been offering eco-cruises throughout Southeast Alaska since 1979. Davey Lubin, owner of Esther G Tours and Taxi in Sitka says his business asks for no taxpayer subsidies, unlike Southeast Alaska’s timber industry. Davey Lubin, runs Esther G Sea Tours and Taxi, a small eco-tour business based in on Baranof Island, one of about 5,000 named and unnamed islands in the Alexander Archipelago. He notes that Alaska’s tourism economy needs no public subsidies, unlike its timber industry. The prime proponent of removing protection for Alaska’s 110 designated roadless areas is Gov. Walker (an independent) who in October suspended his campaign for a second term in office. Walker aligns himself with the timber industry, which has been suing to overturn the roadless rule in the courts ever since President Clinton adopted it in 2001. 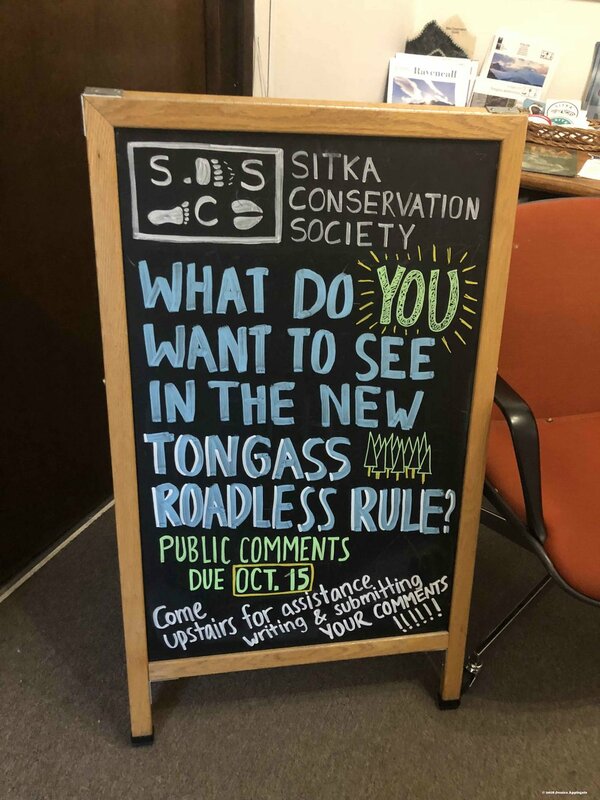 The Sitka Conservation Society encouraged people to comment on the Trump administration’s proposal to rollback the roadless rule. About 33,000 people from around the country submitted comments. Walker’s petition claims the roadless rule has wrought “devastating socioeconomic impacts on Southeast Alaska." 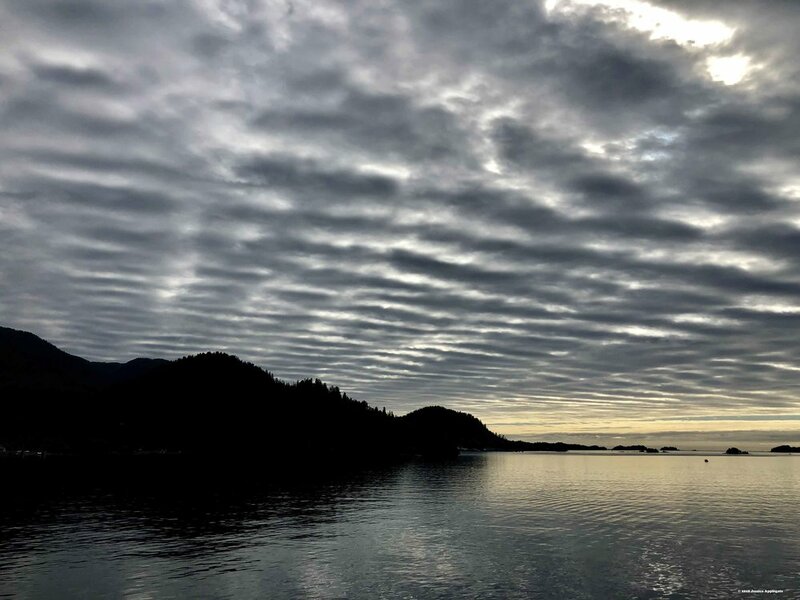 “The petition argues that the extensive damage resulting from the application of the roadless rule to the social and economic fabric of Southeast Alaska is as real today as it was 15 year ago,” says Heidi Hanson, deputy commissioner of state lands in Alaska. But Hjerpe, the Idaho economist, says the petition provides “zero evidence” the Roadless Rule damages Alaska’s economy. The eight-page petition mentions the word “timber” 25 times but says nothing about potential impacts on climate, wildlife or tourism. This fall, the Forest Service aired the proposal at 12 public hearings from Sitka to Washington DC. More than 33,000 people submitted written comments, the vast majority in favor of retaining the rule as is. But the Forest Service produced no audio or video recordings of any hearing. “We are really early in the process,” says Earl Stewart, Supervisor of the Tongass National Forest. Secretary of Agriculture Sonny Perdue will announce a final decision in mid-2020. Before then, the Forest Service will prepare an environmental impact statement (EIS). The public will be able to comment on the draft EIS next summer. Alaska’s congressional delegation, led by Sen. Lisa Murkowski, strongly supports the petition to open roadless areas on the Tongass to logging. Native corporations such as the Juneau-based Sealaska Corp. also want to log the roadless areas. 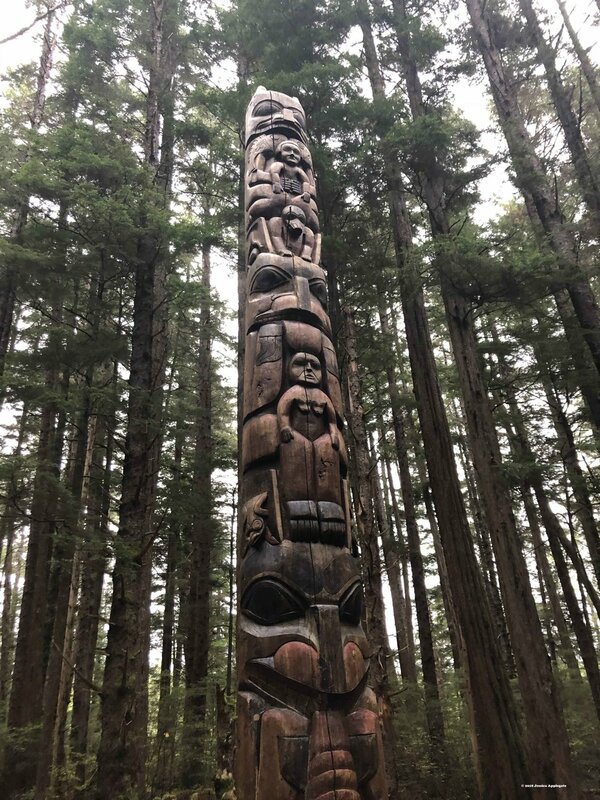 But many Alaska Natives are staunchly opposed, including Wanda Culp, a Tlingit artist and activist who lives in Hoonah, a small village west of Juneau. Wanda Culp. Courtesy Women’s Earth and Climate Network (WECAN). “The message we have to get out is the Earth is in peril. It’s been manipulated, mishandled and abused by people who don’t care. Even some timber companies oppose Trump’s clearcutting plans, including Tenakee Logging, a small family-owned business in Tenakee Springs, located about 70 miles northeast of Sitka. Owner Gordon Chew says his business model is based not upon mass resource extraction but rather “a selective approach” that leaves a viable stand of timber in every one of our small cutting units. For more than two centuries government powers located thousands of miles away controlled Southeast Alaska, starting in the 1790s when Russians in search of otter furs first settled here and continuing now, ironically, under Trump. From the start, relations between the Russians and the native Tlingit, Haida and Tsimshian people were often tense. In 1802, a dispute escalated into armed conflict. Tlingit warriors drove the Russians out of Sheetʼká Xʼáatʼi, the native village now known as Sitka. Two years later the Russian imperial navy returned. This time the intruders drove the Tlingits deep into the surrounding woods, separating them from the place that had always sustained them with abundant salmon and venison. Tommy Joseph, a Tlingit artist in Sitka, carves a totem pole out of an Alaska yellow cedar log. The Russians renamed the settlement Novoarkhangelsk and established it as the capital of Russian America. In 1867, with Alaska’s population of sea otters nearly wiped out, Russia sold Alaska to the United States for a mere $7.2 million. Every October 18, Alaskans celebrate the transfer as “Alaska Day,” but many Tlingits view it sadly as the day they lost their homeland. Starting in 1902, President Teddy Roosevelt began conserving Southeast Alaska’s forests, starting with the Alexander Archipelago forest reserve. At the time, Sitka was still Alaska’s capital, which was relocated to nearby Juneau in 1906. 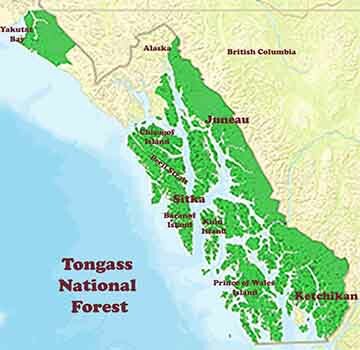 In 1907 Roosevelt established the Tongass National Forest by proclamation. President Calvin Coolidge later added 1.1 million acres to the Tongass, bringing its total size to 16.75 million acres, slightly larger than the entire state of West Virginia. The Tongass now covers about 80 percent of the Southeast Alaska panhandle. But later presidents did not share Roosevelt’s environmental ethic, viewing the Tongass as little more than an inventory of logs to be fed to a rapacious timber industry controlled by distant corporations. 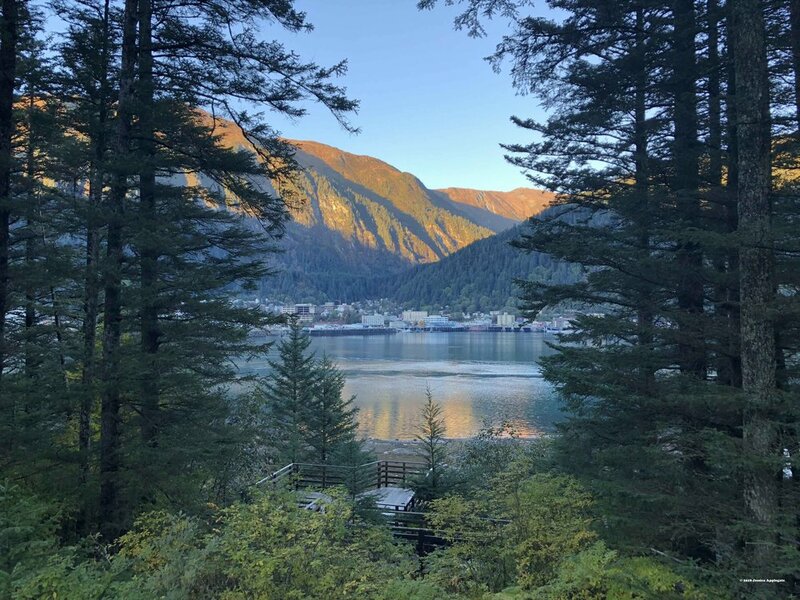 The wholesale removal of trees in the Tongass began in earnest in 1951 during the Eisenhower administration when it signed 50-year contracts with two large paper mills – one in Sitka and the other at the southern tip of the Tongass in Ketchikan. The mills converted the same forest that long ago shielded the Tlingits from armed Russians into pulp and sawlogs to rebuild Japan's postwar economy. The mills were money-losing ventures from the start. In 1980, President Jimmy Carter signed the Alaska National Interest Lands Conservation Act (ANILCA), which explicitly subsidized the mills to the tune of $40 million a year, legalizing subsidies they had already been receiving through creative Forest Service bookkeeping. But Congress repealed the subsidies in 1990 when it passed the Tongass Timber Reform Act over the stiff objections of the entire Alaskan congressional delegation. By 1996, both mills had closed. Despite the mill closures, trees in the Tongass continued to fall and the federal treasury continued to lose money on its timber sales. Rather than process the logs locally, timber operators simply exported them to Asia. But logging slowed down further after 2001 when the Clinton administration approved the rule banning logging and new roads in roadless areas. If Clinton had not acted, the timber industry was on course to cut down 400,000 acres of old-growth in the Tongass every decade. Trump’s rule change could complete the liquidation of all the remaining commercially valuable old-growth in the Tongass in just a few decades. “These last remaining wild areas are precious to millions of Americans and key to protecting clean water and abundant wildlife habitat, and providing recreation opportunities,” Clinton said at the time. “These unspoiled places must be managed through science, not politics." But federal rules are only temporary. One president’s regulations can easily be reversed by the next, supposedly only with adequate justification. When the Trump administration announced in August its plan to allow logging and road-building to resume in wild parts of the Tongass, it signaled that the forest once again was at risk of being managed by politics rather than science. And outside forces could exert even more control over what happens in Southeast Alaska. Logging is already allowed on portions of the Tongass outside of its 110 roadless areas. For example, the Forest Service is expected to announce a decision soon to approve a massive timber sale project in a roaded area on Prince of Wales Island, located about 100 miles south of Sitka. The Prince of Wales Island timber sale would be the largest in the United States in more than 30 years, according to Holly Harris, an attorney with the Juneau office of Earthjustice, an environmental law firm. Forest Service records show about 94 percent of the contiguous stands of large old-growth trees on Prince of Wales Island have been logged since 1954. Like all logging on the Tongass, the Prince of Wales timber sale project is expected to be a huge money loser for the federal treasury. The costs of preparing the sale and building 164 miles of roads needed to access the area’s 600 million board feet of timber is likely to exceed revenues by $422 million, according to an analysis by Taxpayers for Common Sense, an advocacy group. The group obtained the data after filing a Freedom of Information request with the Forest Service. Between 2005 and 2014, timber companies paid the Forest Service only 9 cents for every dollar the government spent preparing timber sales in the Tongass National Forest, according a 2016 report by the US Government Accountability Office (GAO). Building roads on the Tongass cost about $250,000 per mile. But the GAO report did not include the cost of building roads. Taxpayers for Common Sense says that if roadbuilding costs were added, timber sales on the Tongass have lost more than $25 million per year since 1999. Moreover, if implemented, the Trump plan to rollback the Roadless Rule in Alaska would increase financial losses from Tongass timber sales “substantially,” says Ryan Alexander, director of the taxpayer group. Despite the subsidies, timber companies are not exactly standing in line for a chance to bid on cheap Tongass timber. In recent years, no one offered a bid on nearly half of all Tongass National Forest timber sales. And of the timber that did sell, many of the timber operators defaulted. Earthjustice’s Harris said the Forest Service recently spent $3.1 million constructing logging roads on Kuiu Island southeast of Sitka but received no bids for the timber. The agency estimated that the sale would have generated a return of only $195,000, or about 6 cents on the dollar. Public Employees for Environmental Ethics, an advocacy group based in Washington DC, has found that timber sales on the Tongass were ecological as well as financial debacles, says Jeff Ruch, the group’s executive director. “This national forest runs major commercial timber sales like a cookie jar without a lid,” Ruch says. Paul Koberstein is editor of Cascadia Times. Jessica Applegate is managing editor. The Tongass forms the northern 300 miles of the Cascadia Temperate Rainforest. At one time the rainforest occupied the 2,000-mile-long coastal strip stretching from San Francisco to Yakutat Bay northwest of Juneau. Over the last century, industrial-scale logging operations carved up the redwood and Douglas fir regions in the south, leaving only the Tongass section intact. Soon it too may go to the chopping block. The Tongass contains one-third of the old-growth rainforest remaining in the world’s temperate zone, the area between the tropics and the Arctic. Other remaining segments of the globe’s coastal temperate rainforest ecosystem can be found in Chile, Norway, Japan, New Zealand, the United Kingdom and southern Australia. Call your US Senators and Representatives and tell them to not exempt the Tongass or any other national forest from the roadless rule. Speak out against old-growth logging and clearcutting that are damaging forests in your state. For example, in Oregon, the advocacy group Oregon Wild recently launched a campaign to modernize logging laws in the state.